Here in this post, we'll see how you can Recharge any Reliance Jio Mobile Number using Jio's MyJio App and get ₹ 50 discounts in the process. We suggest you walk through this process while we describe it to you. We call it "JIo Voucher Trap Method". 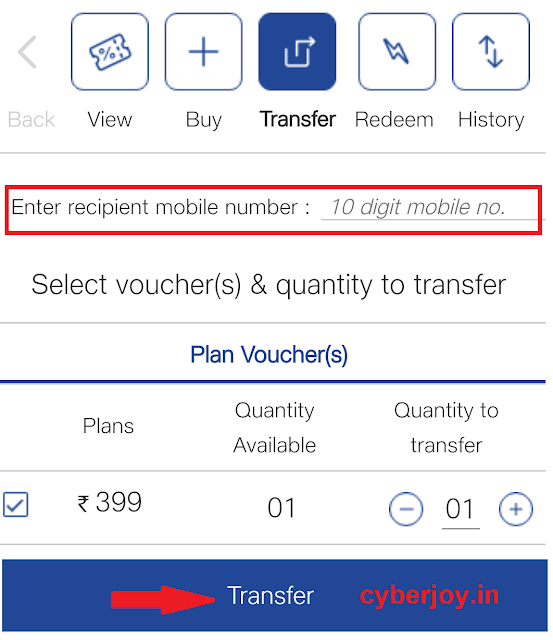 By default, Jio does not allow a Jio customer to recharge any other Jio number (for saying his/her family or friend's number) and get ₹ 50 discounts. A user has to recharge his/her self number only to avail Jio Voucher discounts to count. 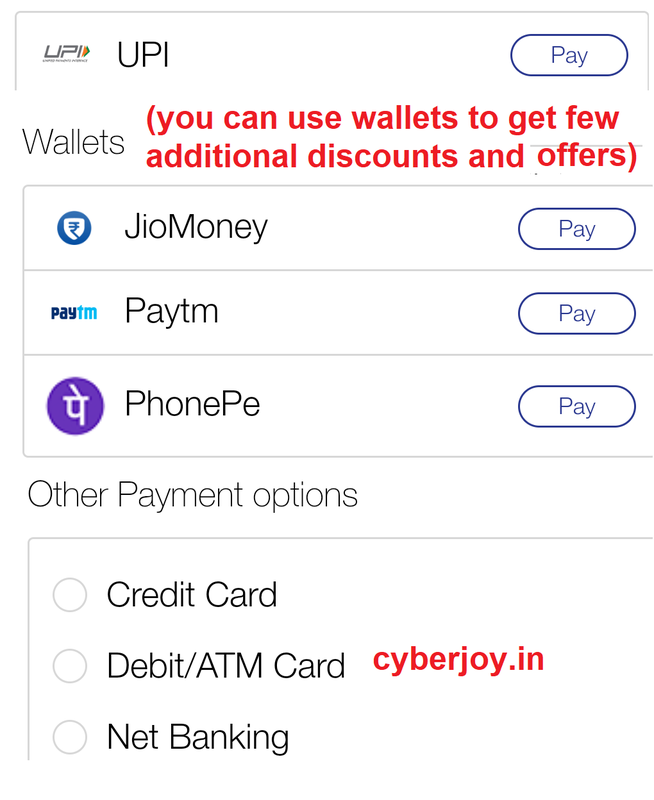 This guide shows how to properly use your ₹50 Discount Coupon Vouchers [which you have already got from your previous recharges] in your My Voucher section inside MyJio App. These can be used to recharge any Reliance Jio Mobile Number (including own number), for a recharge of ₹ 349 and above. That means for a minimum of ₹349 recharge you'll need to pay ₹ (349-50) = ₹ 299 only. # How to Recharge any Reliance Jio Mobile Number in your My Jio App with ₹ 50 discount voucher: "Jio Voucher Trap Method"
Login MyJio app, using Jio sim's mobile data will automatically make you logged in. Check in the My Voucher section inside My Jio app and confirm you already have ₹ 50 discount vouchers. 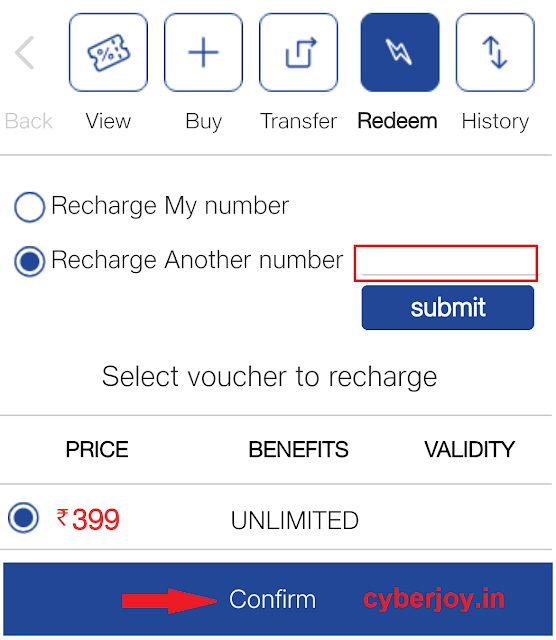 # Note that: Only one discount voucher of ₹ 50 can be used in a single recharge, of ₹ 349 and above. Now follow the steps as shown the below process. Open My Jio app, log in if you haven't logged in already. Then go to ➤ My Vouchers. Step 2: You'll see your existing number of vouchers present in your My Jio account, in my our case we had 16 number of ₹ 50 discount vouchers. You must have at least 1 coupon present here. Now click on the ➤ Buy icon. Select your desired recharge value of ₹ 349 or above. Now click on ➤ proceed. In our example, we have chosen ₹ 399 recharge, which is one of my favourites and also most popular recharge. You'll see one ₹ 50 discount coupon is used, and the effective price is reduced by 50 Rupees. Like in our case it becomes ₹ 349. Now pay using any your favourite method which suits you. We prefer using Wallets like Google Pay, PhonPe, PayTm as it sometimes feels more convenient to use them because you don't have to remember too many details like card number and bank details etc. And if you are a New User they may even offer you an additional discount of up to 100 Rupees. 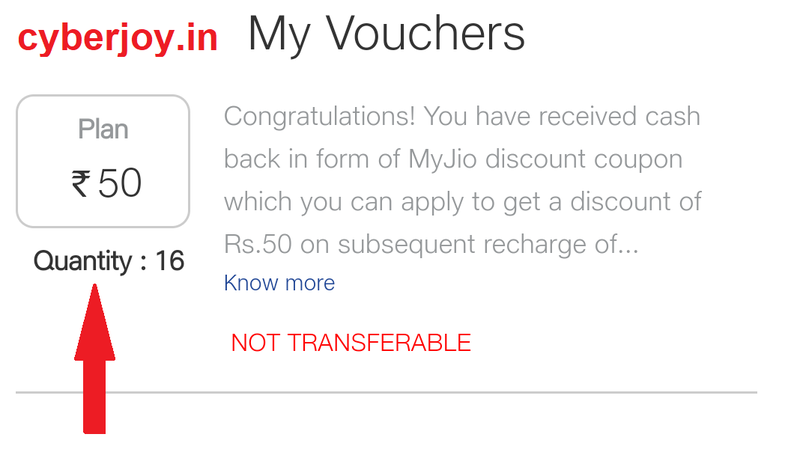 After successful payment, now check your ➤ My Voucher section, inside Myjio App. You'll see you have received a recharge voucher of your desired amount. In our case we have got one Recharge Voucher for ₹ 399. Congratulations, now you have successfully completed the tricky part of Trapping the Jio Voucher. Now you can use that to recharge any reliance jio number soon or later anytime as you wish. Now you can use that Recharge Voucher and transfer it to anyone so that they can use that in a later time. Use the transfer option, and provide recipient number, then click ➤ Transfer. If you still find any difficulty make sure to comment. If you like this step by step process, share it with your friends, and help them too. If you think we missed something, or have any suggestion to make this post better, please give us feedback. Jio aka Reliance Jio Infocomm, has come up as the biggest and the greatest mobile operator in India. Nobody is close to Reliance Jio when it's about raining offers and discounts to its customers. From offering low price Jio 4g mobile aka Jio Phone, to providing many free services through its Jio Apps ecosystem. Those ₹ 1500 (effectively free) Jio Mobile Phones have changed the 4g demographics of India, with its intake in the feature phone market. Though 4G Jio services are very high in quality, because of the ever-increasing customers its network quality is degrading in few areas. Will it give me 1.5 GB additional Jio Double Dhamaka benefit? Yes, it'll give you normal recharge benefits. There was a problem with the comment system, so unfortunately one comment was deleted. He asked about if he recharge with 399 now, and then activate the pack later, will he be eligible for Jio Double Dhamaka offer of extra 1.5 Gb/per day? Yes. By recharging with Jio now, you'll get a voucher in your my jio app, which will enable you to activate the Double Dhamaka offer. In short if you recharge with 399 normal pack of daily 1.5 gb data will be auto activated. And you'll receive a voucher to activate that extra 1.5gb per day. So thus the total data will be 3Gb per day. Hey i have another data pack activated which is due nxt month and i want to avail this offer and use it after my current pack what should i do? And my current plan is on another network. After buying the voucher you should recharge that either for your number or any of your choice. Because Jio Double dhamaka is applicable for recharges within this month, until new offer comes. Though if you do a recharge within your existing pack validity, it'll not be activated instantly, it'll be kept in the queue. And then when your existing pack validity expires then only the new plan will get AUTO ACTIVATED. I don't have any active plan on my jio number, if i recharge now will i be able to activate it later or it'll get activated automatically on recharge. 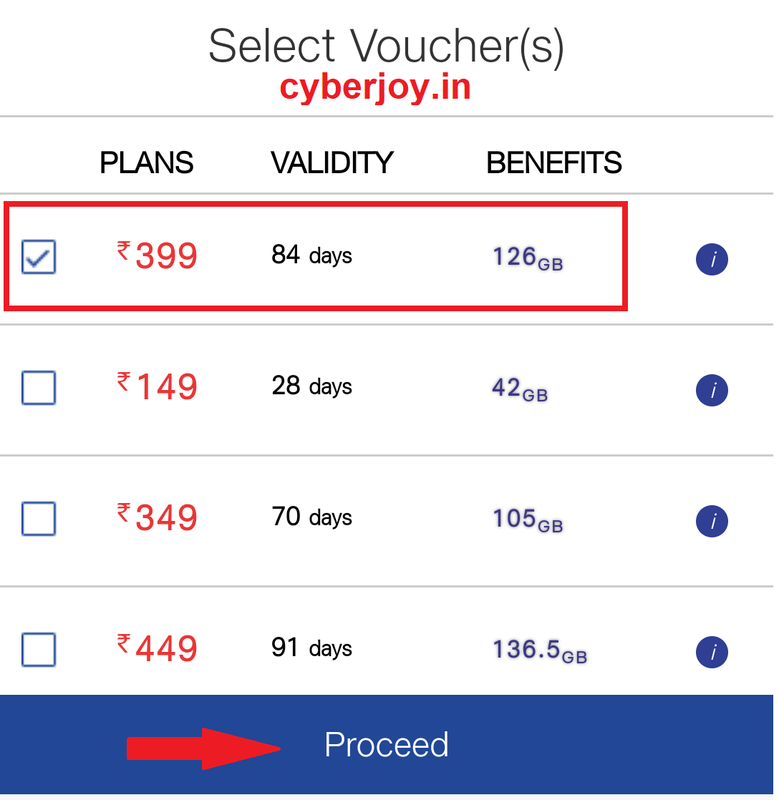 Yes, you can recharge any Jio number, anytime with that voucher. But to get the Jio Dhamaka Plan, you should recharge within this month June. Are these recharge vouchers (Rs 399) which we are buying during the process still transferable? I mean can you send me the link of the terms and conditions for those recharge voucher? "Buy your vouchers when you can. Recharge them when you need. Did you know that, with other operators, doing a recharge while you have an active plan can result in your current plan to expire prematurely. And waiting to recharge till your current plan is fully utilized may leave you with no balance and no service. Introducing a revolutionary concept from Jio - My Vouchers. 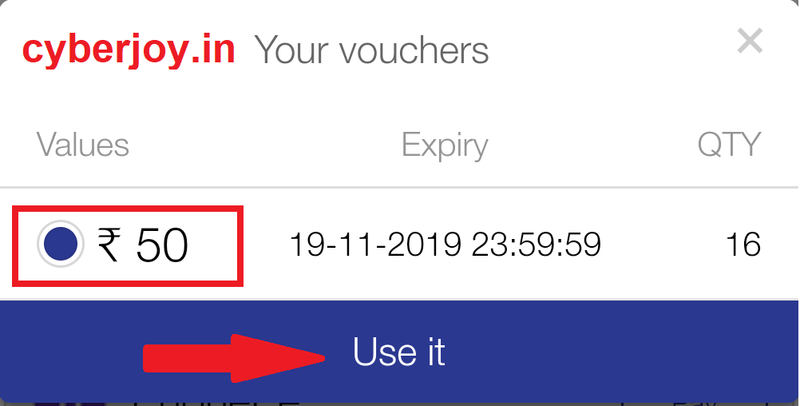 A way to conveniently buy and store your Jio Voucher(s) ahead of time, in digital form. Your vouchers are always available at your fingertips, for you to use at a time of your choosing. You can even transfer these digital vouchers to your friends and family for them to use. In short, the power is in your hands. You decide when to buy, when to use and who should use." Yeah!! It worked. Thanks for the information. It was really helpful. The first recharge validity date is almost to be completed(in 6th July). So , Please tell me ...can I get next 84 days validity for which I have recharged earlier...Ihave got vouchers twice. Yes, you do not need to do anything. Your 2nd pack will be activated automatically after the expiration of the first pack. You can check for that in your My Jio App 2nd pack will be in the queue. I have taken two packages of ₹399 for one sim at the same time. Can I transfer one of my packages to another sim? If yes, please tell me the procedure for the same. If you have got two unused vouchers, you can use them to recharge any number of your choice. Steps are very simple, goto My Jio App then login with that sim which have those vouchers. In My Jio app goto> My Vouchers> Reedem > Select recharge another mobile> confirm. It is asking my card number .what to do next? You have to pay the money through any of the process. It is same like you do for transactions on any shopping sites. I have 23 voucher of 50rs but when i click on redeem button it show no voucher and ask me to buy. now u ll get a 399rs voucher ...now this 399rs voucher can be transferred . Does the plan on another no. gets activated itself? Or that person have to activate it by himself using myjio app. It'll be activated instantly if you use "Recharge another number option" as described in the above post. Can i redeem Jio's 'my coupon ' to another number just like 'my voucher' ? Yes! You can give your coupon to anyone. As Jio has updated MyJio App. Process is changed to a bit. We'll update this post accordingly with the updated MyJio app. Check back soon. This post is updated to match all the requirements. I have 44 vouchers but cannot aplly discount what is the prblm. I m recharg above 350 but till can't show my discount amount. We'll post the updated process. Check back again soon. 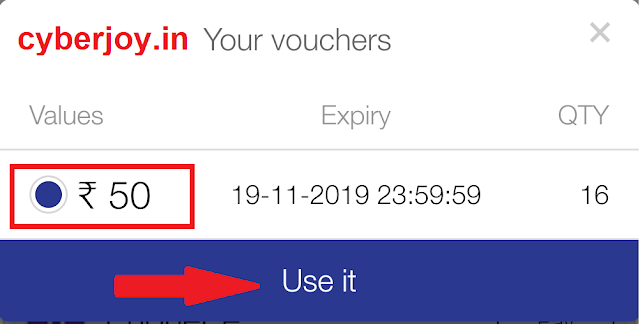 I recharged 399 rs my account by clicking rechargr button, when i check for present vouchers,it still shows nothing,and coupon which i received is a code,how do i redeeem it,pls help me!!! 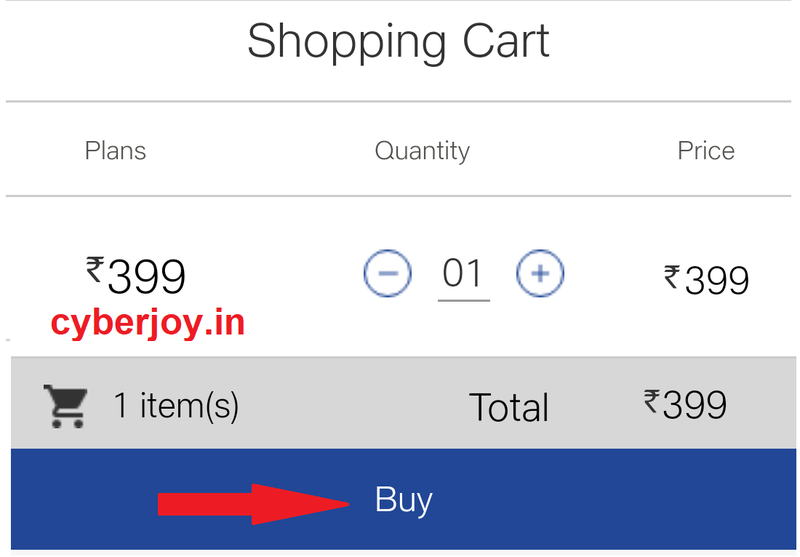 You'll get 8 vouchers of 50 rupees, in your My Vouchers section, in MyJio App. 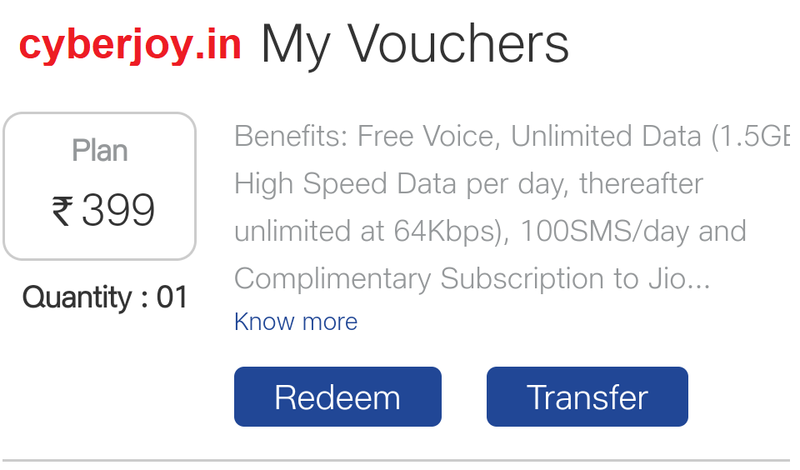 My jio shows that I have 15 vouchers of rs. 50/-. But at step 4. My jio still show 399/-. Rs. 50/- not discounted. Why? Since Jio has updated their My Jio App, this process is changed a bit. We'll update this post accordingly, check back soon. This process worked for me! Thanks..
Do you received all the usual benefits?